arrival to make the card, Elephants on Parade! Aren't they great! I just love the long line of Elephants Pamela has made but I could only fit half on my strip of paper LOL so I only inked the leaders and the babies up for this time. This of course is NOT the sketch but the inside of my card so that it was all tied together. Don't ya just love that printed paper? Basic Grey Lime Ricky! LOVE IT! Here is the card. 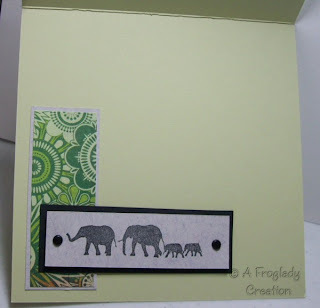 What a fun way to be able to showcase the elephant and still use pattern paper and some fun buttons. 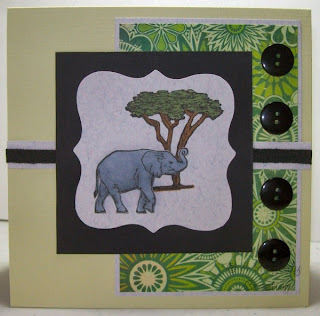 The mat piece for the tree and elephant was cut from my slice and I popped it up off the black and the elephant is also popped up to give some dimension to the card. Don't forget too that you still have time to get your entries in for the Design Team Call. I encourage you to try - even if you have never been on a team before try! I bet if the elephants are long enough, they could go across the whole inside of the card if you turn it the other direction! Very clever to clip them to fit what you want! Karen, this is wonderful. Great job masking! Great job! The 2008-2009 FCD design team says good-bye! Time to Vote on the ParTy hAt! Don't Fall Over here is a 6x6 page! Round 1 and I made it!